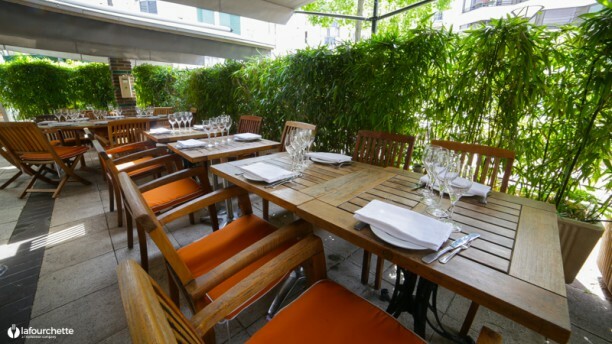 In the heart of the Montparnasse area, near "Gaieté," discover the charming "La Cagouille" restaurant. An address famous in this neighbourhood, the peaceful area makes this establishment an ideal spot. When the weather is nice, you can enjoy your meal on the terrace. The interior design is sober and modern. At "La Cagouille", fish and seafood are featured. The Chef's specialties include extremely fresh fish, shellfish, and other seafood in a simple and tasty cuisine. You will be taken in by the good value, the delicious wine list, and the array of Cognac. Bon restaurant de poissons. Rougets parfaits. Delicious fresh cuisine and good service. The Maitre d kindly talked through the days menu in English for us. Mostly Parisians which was nice and lovely atmosphere. Ideal distance if you’re staying at Concorde Montparnasse. Fantastic seafood. Very fresh. Best we have had in Paris this trip. Very friendly servers too. Very accommodating. Excellente table, probablement le meilleur restaurant de poisson de Paris ! service was very good during the meal. My wife loves seafood and her lobster was very good. i not so keen but do love salmon. Unless i unaware of a certain cooking method my salmon was hot on bottom and cold on the top. No childrens menu so you have to pay full price main courses for our 2 sons. Personally i would not return. Mussels and razor clam were good , fish was lack of seasoning and it doesn’t have any flavor. We also order a crab which was a big mistake, it doesn’t taste fresh and it seems like It has been frozen and defrosted . We asked for the bill and waited for good 20 mins, we couldn’t wait any longer and we end up bring the cheque up front . Totally disappointing. I am sorry for all the disappointments you experienced during your meal. I took into account your remarks especially on the disappointing crab (even if we never freeze our products) and on the slowness of the service. On your next visit we will try to erase all these defects. To thank you for your contructive criticisms, which we need to progress, I propose to offer you your inputs or your deserts. Fantastic meal. Classic fresh seafood. Delicious wine. Perfect start to our stay in Paris. Wonderful food and a very good wine list. Wonderful staff.